 For any specified kind of land use, which areas of land are best suited?  For any given area of land, for which kind of use is it best suited?  compare the requirements of the land-use types with the properties of the land units to arrive at a land suitability classification.  Rice has high water requirements and most varieties grow best in standing water; no other cereal crop will tolerate waterlogging during its period of active growth.  Tea, sugar cane and oil-palm need efficient transport to processing plants; most crops grown for subsistence do not.  For mechanical operations, stones and rock outcrops are limiting; with oxen or hand implements, cultivation can work round these obstacles. A land-use type is a kind of land use described in terms of its products and management practices (Table 3). For reconnaissance surveys at the national level, highly generalized descriptions may be sufficient, e.g. "sorghum production", "conservation forestry". At the district and local levels, it is necessary to specify the use in more detail. For example, will the sorghum production be mechanized or based on animal traction? Will fertilizer be used? Will the conservation forests be managed by the government forestry service or by local communities? Such descriptions serve two purposes. First, they are the basis for determinating the requirements of a use. Second, the management specifications can be used as a basis for extension services and for planning necessary inputs. The land-use types will be based on the promising improvements identified in Step 4. They may be modifications of existing uses, such as incorporating fodder trees or soil conservation measures, or something new to the area, such as the introduction of a new cash crop. Land-use requirements are described by the land qualities needed for sustained production. A land quality is a complex attribute of land that has a direct effect on land use. Examples are the availability of water and nutrients, rooting conditions and erosion hazard (Table 4). Most land qualities are determined by the interaction of several land characteristics, measurable attributes of the land. For example, the quality "availability of water" is determined by the balance between water demand and water supply. The demand is the potential evaporation from the surface of the crop and the soil; the supply is determined by rainfall, infiltration, storage of water in the soil and the ability of the crop to extract the stored water. In the case of "availability of water", it is practicable to calculate reliable quantitative values for the land quality. The water demand of a leafy perennial crop, such as sugar cane or rubber, is much greater than that of a crop with a short growing period, for example beans. A soil water storage capacity of 200 mm might be enough in a humid area but not enough where seasonal droughts occur. For major crops, quantitative models have been developed to estimate crop yields under a range of quality values. Recommended varieties. Varieties are selected locally to suit specific sites and according to the season. The growing period must be long enough to span the flood period and to allow cultivation and harvesting under favourable conditions.  The quality must have a substantial effect either on performance or on the costs of production. Some qualities affect most kinds of land use, for example "availability of water"; others are more specific, for example "conditions of ripening" is a quality that affects grain crops but not rubber.  Critical values of the quality must occur in the planning area. If a quality is adequate everywhere, there is no need to include it. For example, most tropical crops are sensitive to frost but, in most parts of the lowland tropics, the land quality "frost hazard" need not be considered. Having selected relevant land qualities, it is necessary to decide which land characteristics are to be used for measuring them. For example, the quality "erosion hazard" requires information on rainfall intensity, slope angle and soil properties. A compromise must be reached between characteristics that most closely define the land quality and those that are less precise but on which information is more readily available. Out of necessity, the choice is limited to those characteristics for which information is already available or can be gathered quickly. If there is no information on a critical land quality, surveys must be carried out or research initiated. Land evaluations are sometimes conducted directly in terms of land characteristics, e.g. by using rainfall instead of availability of water, slope angle instead of erosion hazard. There is, in fact, a hidden use of land qualities in this way of doing things, since plants do not actually require rainfall but do require water (which might alternatively be obtained from a high water-table in a dry area, for example). In practice, evaluations carried out carefully using either qualities or characteristics give quite similar results. In Step 3, land units were identified as a basis for the diagnosis of problems. It may now be necessary to map these units in more detail, e.g. by dividing land systems into land facets or complex soil mapping units into soil series. The criterion for choice of land units is that they are expected to respond to management in a relatively similar way at the scale of the study. Whether it is now necessary as part of the land-use plan to conduct original surveys depends on the requirements of the plan and the detail and reliability of the information available. Soil surveys, agroclimatic studies, forest inventories and pasture resource inventories are major sources. For land-use planning at the national level, reconnaissance surveys at scales of about 1:250000 may be adequate; district-level planning will need at least semi-detailed surveys at a scale of about 1:50000. Natural resource surveys take a substantial amount of time and will delay the planning procedure. However, past experience has shown that to proceed with land development projects without adequate resource data can lead to disasters, both for production and conservation. In practice, resource surveys and studies of land-use types can proceed at the same time, with frequent interchanges of information. Note: There is no standard system for letter designations of limitations; first-letter reminders should be used where possible. Limiting values are the values of a land quality or land characteristic that determine the class limits of land suitability for a certain use. The standard FAO land suitability classification is shown in Table 5. The first and most important decision is to separate land that is suitable from that which is not. Important criteria for deciding on the suitability of land for a specific use are sustainability and ratio of benefits to costs.  The land should be able to support the land use on a sustained basis. This means that the use must not progressively degrade the land. Many changes of land use cause an initial loss of land resources: for example, when forest is cleared for tea plantations or for arable farming, there is always a loss of forest habitat and wildlife as well as of soil and accumulated plant nutrients.  The use should yield benefits that justify the inputs. The user has to make a reasonable living from the land. Local experience will usually be the best guide. Alternatively, a financial analysis can be undertaken. It is then possible to distinguish up to three classes of suitability, although this is not always necessary. Land classed as highly suitable is the best land for the specified use; moderately suitable land is clearly fit for the use but has limitations; while marginally suitable land falls near to (but above) the limit for suitability. Land that is not suitable may be subdivided into permanently not suitable, where there are limitations to sustained use that are clearly impractical to overcome; and currently not suitable, where such limitations could be overcome but not at a currently acceptable cost. * Elevation is used to assess sufficiency of energy where temperature data are not available; these values apply to Sri Lanka. Source: Dent and Ridgway (1986). The construction of a table of limiting values for each land suitability class (see Table 6) is a central operation in land evaluation. To do this, information is needed on the performance of a land-use type over a range of sites, taken either from trials or the experience of land users. The land requirements for several individual crops can be combined to assess the needs of a land-use type that includes several crops grown together or in rotation.  allocate each land unit to its land suitability class according to the most severe limitation (Fig. 8). For cases in which at least one limitation is enough to render the land unsuitable for the use, the method of taking the most severe limitation is valid. For example, for maize cultivation it is of no use having level land and sufficient rainfall if the soils are highly saline. For less severe values of limitations, alternative methods of combining ratings for individual qualities can be used. Matching, however, can become a wider process than the simple comparison of requirements with qualities. Wherever this initial comparison shows certain land units to be unsuitable for a given use, the specification of the land-use type can be examined to see if, by modifying it, the suitability of those land units can be raised. Thus, if suitability has been downgraded owing to erosion hazard, a new land-use type could be designed with the addition of contour-aligned hedgerows or other soil conservation measures. The use of fast-maturing crop varieties in areas with a short growing season is another example. By adapting the land-use types to meet the limitations present in the area in this way, higher overall suitabilities can be achieved. A further possibility is the introduction of land improvements, inputs which bring about relatively permanent improvements in the characteristics of the land. Examples are drainage of land that is too wet or terracing of steeplands. In this way, the land is adapted to the requirements of the land use. Land improvements invariably require maintenance as well as capital expenditure. Some decisions need only qualitative land evaluation: for example, identifying the critical importance of certain areas for important land uses such as for an export crop. Quantitative economic evaluations, however, require estimates of crop yields, rates of tree growth, or other measures of performance. It is not realistic to predict the performance of each land suitability class unless data are available on plant growth (or other measures of performance) and the relevant inputs from well-characterized sites, and unless the physical characteristics of the land mapping units are equally well known. Quantitative models have been developed for several major crops but these demand good data. Even when predictions are based on carefully controlled trials, they may be confounded in practice by variations in management. Therefore, try to estimate a range of performance under the likely standards of management. Prepared by the Directorate of Overseas Surveys, 1976. Source: Thomas, Lo and Hepburn (1976). The comparison of requirements of land-use types with properties of land units is brought together in a land suitability classification. 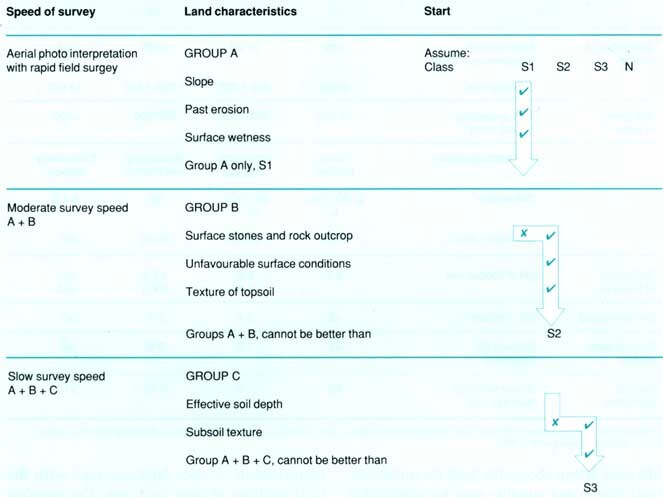 Suitability is indicated separately for each land-use type, showing whether the land is suitable or not suitable, including - where appropriate - degrees of suitability (Table 5). The major reasons for lowering the classifications, i.e. the land limitations, should be indicated (because of erosion hazard in one area or a high water-table in another, for instance). In large or complex surveys involving many mapping units land evaluation can be assisted by the use of geographic information systems (see p. 77). A major facility is that, if the land suitability data are entered into such system, when a change is made to one or more limiting values, new maps of land suitability can be rapidly produced.  descriptions of these land-use types. The descriptions of land-use types are given in a degree of detail appropriate to the level of planning. At the national level, only outline descriptions of major kinds of land use may be needed. At district and local levels, land-use type descriptions should specify the management, inputs (e.g. seeds, fertilizer, fuel) and estimated production (see Table 3). Such information will later be needed to make provision for the supply of inputs and for storage, distribution and marketing (Step 9). The evaluation process in this step will almost certainly have shown up information deficiencies. The tolerances of plants (or of crop cultivars, tree provenances) to particular land limitations are rarely known with any precision. Where new land-use types are proposed for introduction to the area, it will be necessary to conduct trials (on-station and on-farm) to validate their performance before they can be safely recommended for adoption. Gaps in knowledge of land resources may also have been revealed, thus calling for additional surveys.  Outside the land-use plan. Draw the attention of national and international research agencies as well as universities and donors to the need for research in specified aspects if land development of the area is to proceed on a proper basis of knowledge.  Within the land-use plan. Based on existing local institutions (strengthened if necessary), set up trials or other research activities as part of the land-use plan itself. Either of these ways will form a "research loop", feeding back information for making more reliable evaluations and more productive and sustainable land use in the future. Do not be put off by the apparently long time scale, three to five years as a minimum, of most kinds of research. By anticipating likely problems, there is a better chance of results becoming available when they are needed.  Describe land-use types in sufficient detail for subsequent analysis.  Select land qualities and land characteristics to be used in comparisons of land-use requirements with land.  Map the land units and determine their relevant land characteristics and qualities.  Set limiting values to land-use requirements, to be used for determining class limits for land suitability. Take into account sustainability and the ratio of benefits to inputs. - consider land improvements that could make the land better suited to the land use. 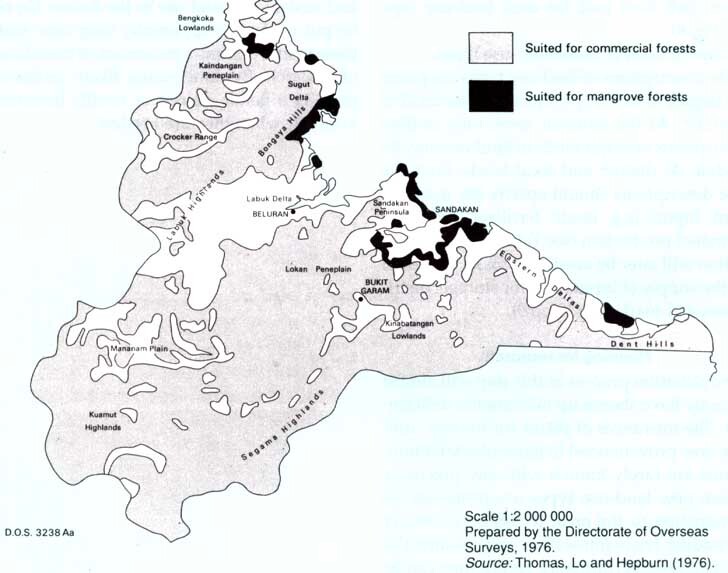  Map land suitability for each land-use type.  Plan for research needed: additional surveys, research by outside agencies or within the land-use plan.